Ozzi Cat – Australian National Cat Magazine – Issue 16 | WINTER 2016 | Ozzi Cat. Australian National Cat Magazine & Cat Behaviour Consulting. Solutions for Cat Problems. How to Keep Cats Happy. Ozzi Cat helps and donates money to rescue cats in need. $1 from your magazine copy is donated to a cat rescue to cover vet bills, for food, bedding, and toys for cats. Help kitties in need to live a happy life – just read our national Ozzi Cat Magazine to learn more about cats and awesome cat people, and we will donate money on your behalf! Purchase your copy below. 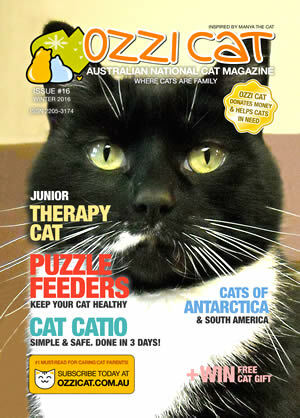 #1 Australia’s Must-Read Cat Magazine for Caring Cat Parents. Read amazing cat stories and learn handy cat care tips, plus product and DIY. Win a gorgeous cat-themed gift! Your copy supports Australian cat rescue groups. THIS ISSUE’S FEATURE: CATS OF ANTARCTICA. (PDF, 13Mb) You will get a download link by email. You will need Adobe Reader or any other software to open the file. After purchasing this issue, Get Annual Subscription to Ozzi Cat Magazine – don’t miss an issue, automatically delivered to your door or by email! Looking for a gift for a cat lover? You found the best option! Ozzi Cat Magazine Gift Subscription in now available!